I tried to blog about “healthy” foods and things that felt fresh and new. I tried to borrow some of that California flair from my new West-coast home. I put kale in my pasta and avocado on nearly everything I ate, and that was fine, too. But that didn’t really make my heart happy. Ultimately life’s about going after what you love. 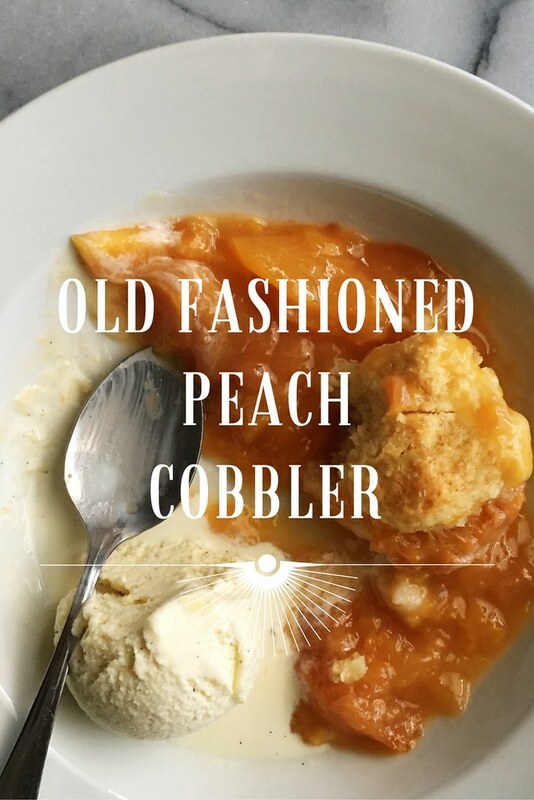 And if what you love is peach cobbler, what’s to stop you? I’m all about peach cobblers and pies and cookies; mashed potatoes and wedge salads and mac & cheese. I love a good veggie sandwich, especially with crunchy pickles on the side. (When I was in high school, my Dad packed a veggie sub in my lunchbox almost every other day.) The food that delights me is casual, it’s American, it’s fun and festive. It’s Caesar salads and grilled veggies, oreo balls and Buckeyes. The other type of food I love to eat, but never quite mastered cooking, is Tamil food. My family’s from Tamil Nadu in South India. My mom has cooked my grandmother’s recipes, and her own, for as long as I can remember. Spicy stews, curries, dosas, and spiced rices are what I grew up eating. They’re serious comfort food for me. My mom has always cooked with such love and heart, and she’s one of the best cooks I know. I never came close to mastering her recipes, but I still try to cook them at home every so often. Just saying, I may revisit Indian food on this blog later. Don’t be surprised if you see a recipe for something a little different on here. So this is what a food blog written by me must look like. True blue American fare, with a dash of Southern charm and maybe the occasional South Indian recipe. After all, we can only be who we are. Today, we’ll focus on good old-fashioned Southern classics. 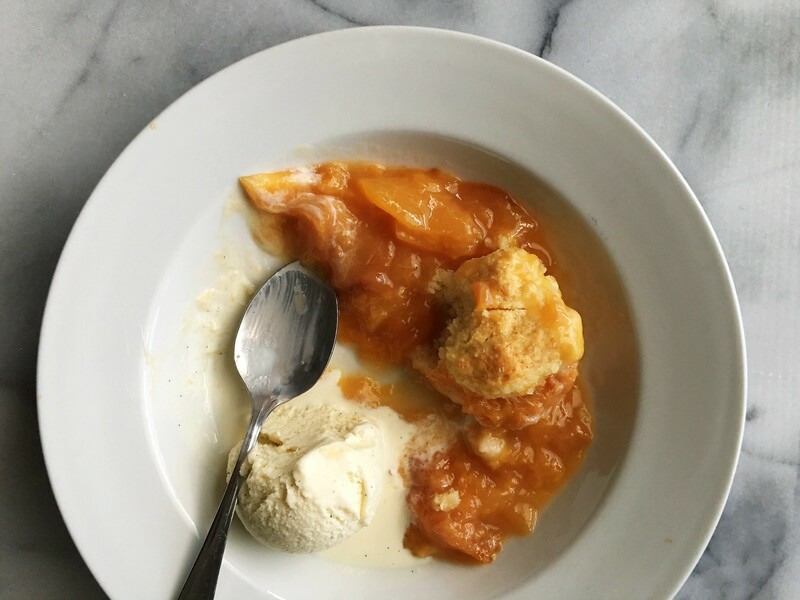 In particular, this amazingly simple but truly delicious peach cobbler. 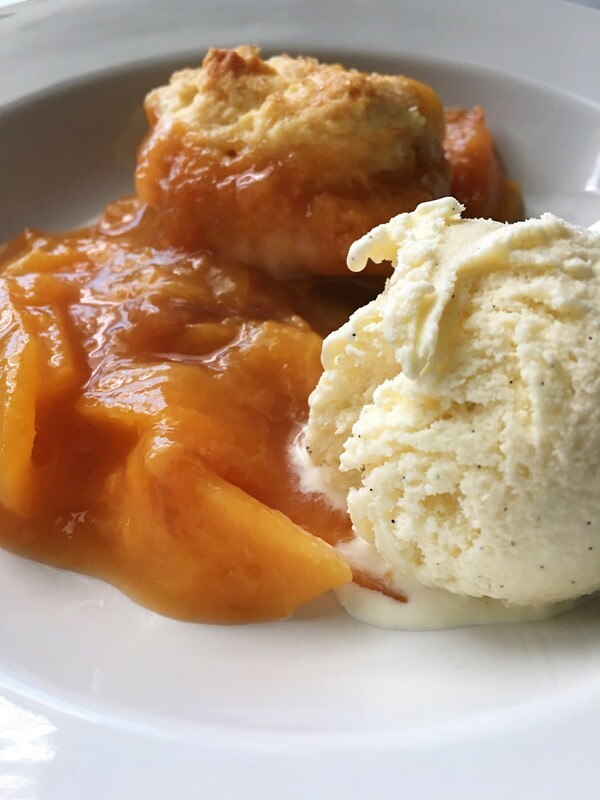 My first memory of homemade peach cobbler is standing in the kitchen with my Mom, reading over a recipe from America’s Test Kitchen. My family didn’t bake a lot growing up, but apple pies and chocolate chip cookies were in our regular rotation. We only made the peach cobbler once, but it was good enough to make an impression. 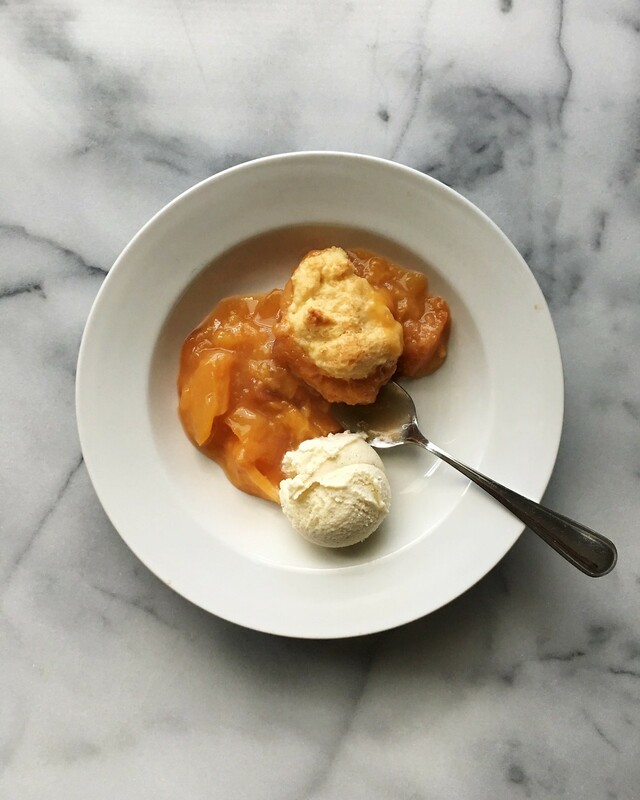 This cobbler isn’t the ATK recipe, but I love the perfect balance of sweet to sour, of warm peach to delicate biscuit. I’d serve it warm, topped with whipped cream or a scoop of blue ribbon vanilla ice cream for the best summer treat. 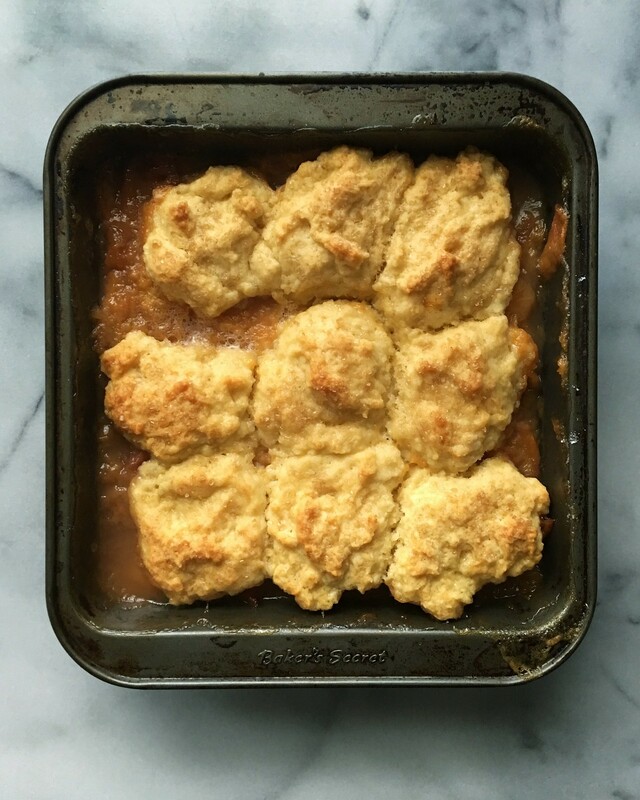 A simple, old-fashioned peach cobbler. Sweet summer fruit topped with delicate, sugar-sprinkled biscuits. Begin by peeling, pitting and slicing the peaches. Bring a large pot of water to a rolling boil. In the meanwhile, fill a large bowl with cold water and ice. Cut a small “X” in the bottom of each peach. Use a slotted spoon to lower the peaches into the boiling water. Boil for no more than 30 seconds, then transfer into the bowl of ice water for a few minutes. Once peaches are cool, use your hands to slip the peel off— this should be pretty easy. Pit and slice the peaches. In an 8×8 inch square dish, toss together the sliced peaches, 1/2 cup sugar, and 2 tablespoons flour. Set aside. In a separate bowl, whisk together the flour, remaining 2 tablespoons sugar, baking powder, and salt. Cut in the butter, crumbling it into the flour mixture using your hands or a fork. Whisk together the milk and egg. Add to the flour mixture and stir together until just barely combined. Dollop large spoonfuls of the biscuit dough onto the peach base. Sprinkle generously with demerara sugar. Bake at 350 F for 35 minutes, until the biscuits are cooked though and golden brown, and peaches have softened and released their juice. I actually feel a lot of pressure sometimes when I am with friends at a restaurant to order something trendy. Or pressure to not order something I really like but feel like is cliche. This is true enough that a particular food instantly popped into my head when I read your post: Caesar salad. It was the first salad I ever really liked or ate with a genuine combination of willingness and regularity. But I honestly NEVER order it out. I feel like it is kind of pejoratively American and I feel like it is not a very refined choice. But I love it! It is nutty and a little fishy in a good way. I think the ones at chain restaurants are tasty, the supermarket versions are tasty, and the ones they make at the table at a great Italian restaurant are tasty. And while I like kale caesar, the less-cool crunchy romaine is such a pleasure to me. This is such a great post because I feel like an underlying question is, “Who in the hell am I trying to please by making avocado toast?” Or not eating Caesar salad? Like, literally, what well-adjusted person cares? Life is really short and the extra energy it takes to do stuff you don’t really love seems like a bit of a waste, you know? Also, not just doing things to please other people think is something I’ve been thinking about on a larger scale. I often find myself not doing things because I’m worried what other people think. Especially holding myself back from creating content– from putting a post on my personal blog, or updating a profile, or even creating an image/ video/ whatever. But I’ve been working on sharing and doing stuff that feels very authentic to me, and that I can stand behind. If someone doesn’t like it, that’s fine– because it’s 100% me, and it makes me happy. Karrie, I’m so glad this post resonated with you! Congrats on the two years with your blog + the big changes coming up. I can’t wait to see what they are! You always create really interesting + high quality content, so I can’t wait to see your new idea come to life. I’m also coming up on two years with my blog, and I feel like I’m finally realizing what blogging’s all about. Hopefully going with what feels right over what I think I *should be* posting from here on out. Also I love meeting fellow Floridians! I grew up in Gainesville myself… Not quite the South since it’s in Florida, but close food-wise.